Steven Kasher Gallery is honored to present a monumental, first of its kind solo exhibition of over 20 life sized photographs by Maekawa, one of Japan’s rising stars in the field of wildlife photography, and the recently announced grand prize winner of the first Nikkei National Geographic Photo Prize. This marks Maekawa’s first exhibition in the United States. Looking at Maekawa’s sublime photographs of animals is an immersive experience. They give the viewer the feeling of entering into the landscape and confronting these magnificent animals in their pristine natural habits. Maekawa’s thrilling images transform nature photography into art. 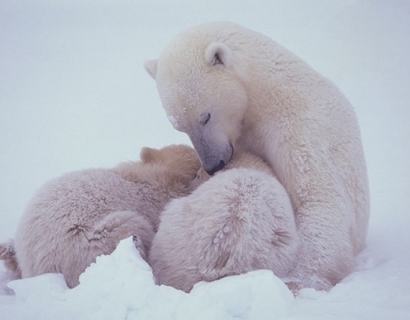 Since 2000, Maekawa has traveled extensively throughout Japan, Asia, Africa, and North America, often working in extreme weather conditions, to make meticulously composed color photographs of animals, including polar bears, eagles, monkeys, wild boars, grizzly bears, giraffes, and wild horses. Maekawa’s work pays homage to a long and rich tradition of animal imagery in Japanese naturalist art. His elegant photographs elicit a powerful emotional connection between the viewer and the animal, with the eye of the animal representing a “window to the soul.” His images range from intimate portraits of a mother polar bear with her cubs and two eagles in flight with their prey, to images taken from a distance of an ape enveloped in a lush green forest, and a lone giraffe walking on a plain against an exquisite night sky bathed in moonlight. His work reflects a sensitivity to his subject and reverence for their surroundings, and a passion for and understanding of the vital need to protect what remains of our rapidly shrinking natural world. through the medium of photography in a manner that evokes a sense of wonder and discovery, excitement and inspiration to a diverse audience internationally. In January 2013 it was announced that Maekawa is the first grand prize winner of this prestigious new award. The prize package includes one million yen in cash from Nikkei National Geographic, and camera equipment donated by Canon Marketing Japan. A first place winner and two runners-up were also selected. Nikkei National Geographic is the publisher of the Japanese edition of National Geographic, the first foreign language edition of the world famous magazine that since 1888 has harnessed the power of photography to help inspire people to care about our planet. Maekawa’s photographs were published in the February 2013 issue of the Japanese edition of National Geographic. Maekawa was born in Tokyo in 1969. He began working under the renowned Japanese photographer Kojo Tanaka in 1997. His work has been published in many books; his recent monographs include Wild Soul (2010) and Animal Eyes (2011). His photographs have been exhibited at numerous galleries and museums throughout Japan. In February 2012, he was part of a group exhibition of contemporary Japanese photographers at the Galerie de Photographie Classique in Moscow, Russia. He is the recipient of the Newcomer of the Year Award by the Photographic Society of Japan. He lives in Tokyo with his wife and three children.